Typhoid fever is defined as a bacterial infection caused by bacteria Salmonella typhi. The infection is caused primarily through ingestion of contaminated water and food, but it can also spread through close contact from one person to another. Interestingly, animals don’t carry this disease, so transmission is only possible through consumption of contaminated food/water and from human to human. The bacteria enter the body through the mouth and spend one to three weeks in the intestine prior to reaching the bloodstream. Although everyone can develop typhoid, children are at a higher risk than adults despite having milder symptoms. 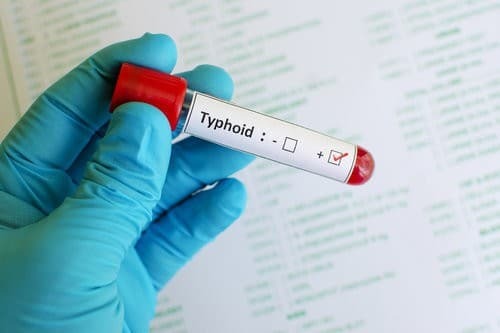 The most common risk factors for typhoid fever include drinking contaminated water, having close contact with the infected individual, working with bacteria that cause the infection, and working or traveling to high-risk areas. The infection causes a number of symptoms but with prompt treatment patients notice improvements within seven to 10 days. The primary treatment route is an intake of antibiotics. What organs can typhoid affect? Since typhoid is a bacterial infection it doesn’t affect one specific organ; instead, it attacks multiple organ systems in the body. After the infection, bacteria reach the bloodstream from where it reaches different organs thus causing various symptoms. The gastrointestinal tract is more severely affected including liver, spleen, and muscles. Through bloodstream, bacteria can also reach gallbladder, lungs, and kidneys. Who should get the typhoid fever vaccine? Who should not get the typhoid vaccine? What is the minimum age requirement for typhoid fever vaccine? Typhoid shot should not be given to children younger than two years of age. On the flip side, live typhoid vaccine (oral) should not be given to a child who is younger than 6. How long before a trip do you have to get a typhoid vaccine? Bearing in mind protective effects of typhoid vaccine occur seven days after vaccination, it is recommended to get a vaccine two weeks or, ideally, a month prior to your travel in order to allow the shot to work. How long does the typhoid fever vaccine last? Typhoid vaccine is 50% to 80% effective measures of prevention of the infection. That being said, no vaccine is 100% effective, and it is not a substitution for paying attention to what you eat and drink. In other words, while typhoid vaccine can reduce your risk of infection, you still need to be careful and employ prevention tips mentioned above. What are the side effects of typhoid vaccine? How many shots are needed? Typhoid vaccine can be administered via injections and orally in the form of capsules or tablets. Inactivated typhoid vaccine shot is given in a single dose, i.e., one shot is enough for protection. On the flip side, three tablets are necessary for people in Australia and Europe while Canadians and Americans need four capsules. In Australia and Europe, tablets are taken on days 1, 3, and five while in North America four tablets are ingested on days 1, 3, 5, and 7. One dose of injectable vaccine provides protection for 2 to 3 years after which a booster dose is needed for people who are at risk. In high-risk countries or regions, protective efficacy 1.5 years after vaccination is 72% while three years later it drops to 50%. When it comes to the oral typhoid vaccine, the series is repeated every year from persons traveling from non-endemic to endemic countries and every three years for people who live in the high-risk regions. For people from Canada oral revaccination is recommended after seven years while Americans revaccinate after five years. What are the infected areas in the world? Typhoid fever is widespread across the globe, but it is less common in industrialized parts of the world such as Western Europe, the United States, Canada, Japan, and Australia. Part of the world with the highest risk of infection is in South Asia. However, infections also occur in other parts of Asia, Africa, and Latin America. What is the transmission seasonality? A person can get typhoid fever throughout the year, but the infection is particularly common during summer. It could be due to the fact typhoid mainly affects regions with poor sanitation and bacteria spread faster in warmer weather. When and where was the last outbreak of typhoid? According to the WHO, last typhoid outbreak occurred in Uganda in 2015. At the beginning of the said year, the outbreak started in Kampala City, and by March 5, about 1940 cases of the infection were identified. From Kampala, typhoid fever outbreak spread to neighboring cities and regions affecting primarily men ages 20 to 39. However, that wasn’t the last outbreak of this infection. In November 2016, typhoid outbreak started in a city called Hyderabad, Pakistan. The biggest problem regarding this latest outbreak is the fact it was caused by drug-resistant superbug strain. Despite the lacking of official data, it is estimated that 800 cases of the infection were detected. Typhoid fever is a common disease that is caused by bacteria we introduce to our body through the intake of contaminated food and water primarily. If you’re traveling to developing countries or places with poor sanitation, it is strongly recommended to get vaccinated. Rare are the occasions when the infection causes complications, but they’re still possible especially when the disease isn’t treated properly.